As I sat in my kitchen a couple of Saturdays ago, listening to a programme on Radio 4 about a luxury glove manufacturer, I never thought for one second that just a few days later, I’d be swapping emails and phone calls with that very same manufacturer on a packaging project. 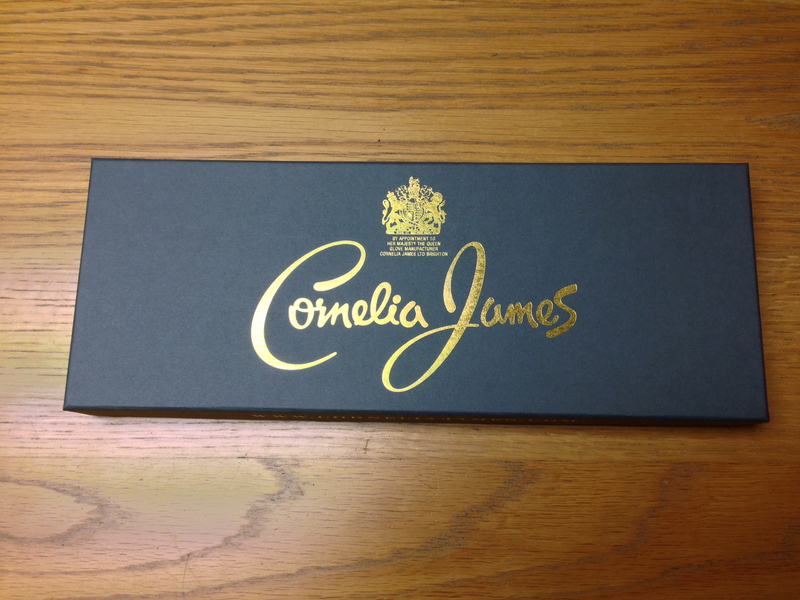 The programme that I was listening to was Saturday Live and the manufacturer being featured was none other than Cornelia James; glove manufacturers to none other than Her Majesty, Queen Elizabeth II. It was a pretty interesting programme, and explained how the design student Cornelia James sought refuge in England in 1939, and after rising to prominence with her unique leather gloves, suddenly found herself with a Royal Warrant and consequently the official glove supplier to Queen Elizabeth. It was a true rags to riches story that provoked real interest and it wasn’t one I was going to forget about in a hurry. Nevertheless, I must admit that it wasn’t the first thing on my mind as I journeyed to work on the following Monday. It was mid-morning when the phone suddenly rang and I was informed that the glove company Cornelia James was on the line. I had a lovely chat with Andrew – Cornelia’s son-in-law – and it turned out that they were after some presentation boxes to go hand-in-hand (pardon the pun) with their product. Of course we were more than happy to oblige, and have since produced the product pictured. One of the things you must understand about the products that Cornelia James produce – they aren’t just ordinary gloves. Quite often, when someone needs to buy gloves, they end up going for any old cheap pair, and whilst they serve a purpose, the chances are that they aren’t going to last too long. 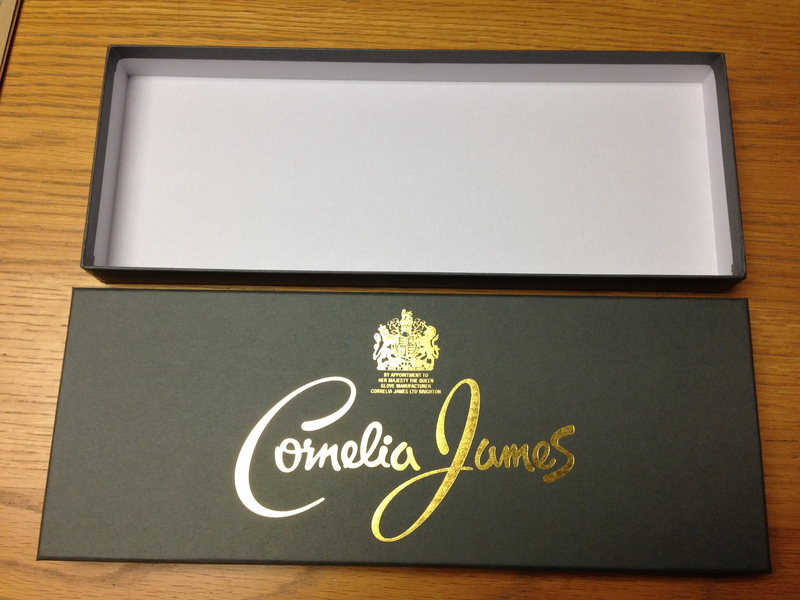 The fact that Cornelia James holds the Royal Warrant for glove production is a ringing endorsement, as a supplier must supply the royal family for five years before obtaining the warrant. These days, Cornelia James has branched out, and at present they offer day gloves, lace gloves, evening gloves, fashion gloves, scarves and pashminas and even ski gloves. Their specialist business continues to thrive, and the fact that they are so specialist got me thinking about some of the similarities that they share with GWD. We both provide a niche product, the kind of things we sell are both widely used and we both have a commitment to producing British crafted products. 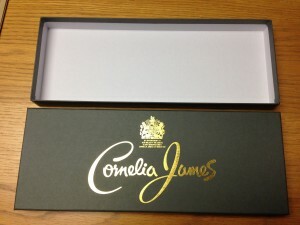 The other idea that the Cornelia James story got me thinking was that it is not just the expected products that require luxurious packaging. Typically you might think that chocolate, wine and sweets are the main three items that need packaging, but clearly, if you want your product to make a statement, it doesn’t matter what it is, it needs to be packaged well. We’ve really enjoyed the work that we’ve done for Cornelia James so far, and we look forward to plenty more collaboration in the future. This entry was posted in Box Making, Design, Gloves, Manufacturing, Presentation Packaging, Promotional Packaging, Uncategorized and tagged Box, Box making, Boxes, Cornelia James, Glove Boxes, Gloves, GWD, Opera, Packaging, Presentation, Presentation Packaging, Promotion, Promotional Packaging, Queen Elizabeth II, Royal. Bookmark the permalink.